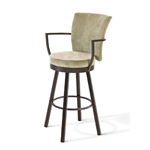 Did you know more home owners prefer swivel stools over stationary? Here’s why, along with the two types and which one is best for you. Easier to get into. If you can turn the seat to the left or right, then you can easily sit in it. If you can’t turn the seat, then you might have to move the stool back to get into it. Easier to interact. Swiveling allows you to face the kitchen and converse or easily swivel to to watch TV or talk to someone in the other room. Allows you to fully rotate 360-degrees around while sitting on the seat. Allows you to rotate 180-degrees, or left and right, while sitting on the seat. 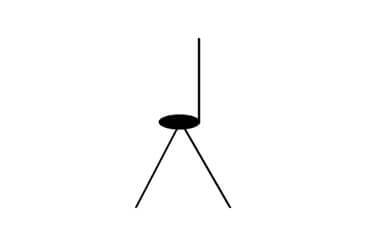 When you get up from the stool, the back will remain in the position you left it. When you get up from the stool, the back will spring to the center. While sitting, the stool will remain in the position you leave it. While sitting, the stool will feel like it wants to spring back to the center, causing you to hold the stool with your feet or hands. In terms of comfort, this swivel is more comfortable. In terms of comfort, the memory-return swivel is not as comfortable. Arms add to your enjoyment when sitting on the stool, especially if you’re sitting for a long period of time. They help keep your posture aligned. When you’re sitting on a stool near your kitchen island, you’ll need a place for your arms. Without arms on a stool, you would rest them on your counter, allowing your back to lean forward. With arms on a stool, your arms stay in one place and are more aligned with your spine. They are safer for kids and will help protect them from falling off a stool when swiveling. They also help you get into the stool by having something to grab onto, especially if the stool is higher like 30 or 34-inches. However, arms also require more space. 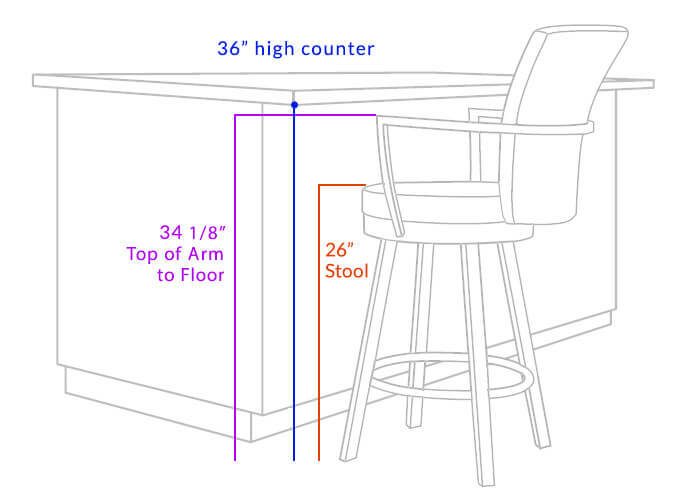 They can make stools wider by 2-3 inches which might minimize the amount of stools you can place at your counter. You’ll also want to make sure your arms slide under your counter to increase the walking space behind the stool. Below, is an illustration for a standard 36-inch high counter. You will need a 26-inch counter stool for this. If you’re going to add arms, make sure the arms slide under the counter, so you’ll want to find a measurement under 36 inches. In this case, the Cardin stool fits perfectly at 34⅛ inches. Remember to check the dimension charts for the stool including the width, depth, arm height, top of seat to floor and total overall height. This will ensure you get the proper size you need. Backs increase the comfort of any stool. If you have a back, you’ll be more inclined to sit in the stool rather than a stool without a back. They come in tall backs or short backs. Short backs are great if you want to see your counter, while tall backs provide more back support. Buy stools with upholstered backs, that way if you do end up banging into the counter, it will be a soft touch. Add felt strips to the edge of your counter or to the back frame on the stool. This special feature is offered on some of our stools which allows you to recline back in the stool. Our swivel plates are made of hardened steel and are typically made by Trendler, the world’s leading swivel manufacturer.